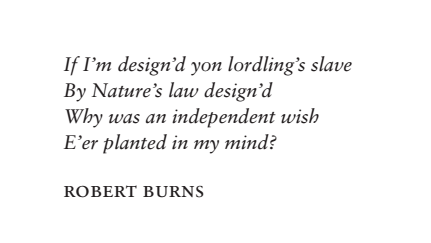 With this in mind the prisoners explored aspects of Burns’s poetry in relationship to subjects such as freedom, independence, slavery, democracy and war. One session was on whether prisoners should get the vote in the Independence referendum. The workshops were a mixture of films, readings, examination of objects from the Burns museum – such as genuine wooden manacles from an 18th century slave ship which the guys all got to try on – which in turn generated political discussions, often passionate and heated. The workshops were good craic as you’d expect in an prison. The prisoners spent the second half of these workshops writing poetry related to the subjects discussed. 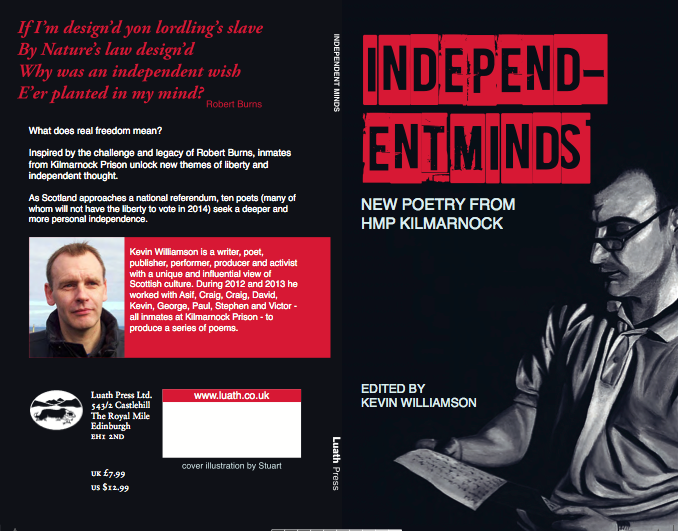 The fruits of their labour are published by Luath Press in an anthology I’ve edited called ‘Independent Minds’. 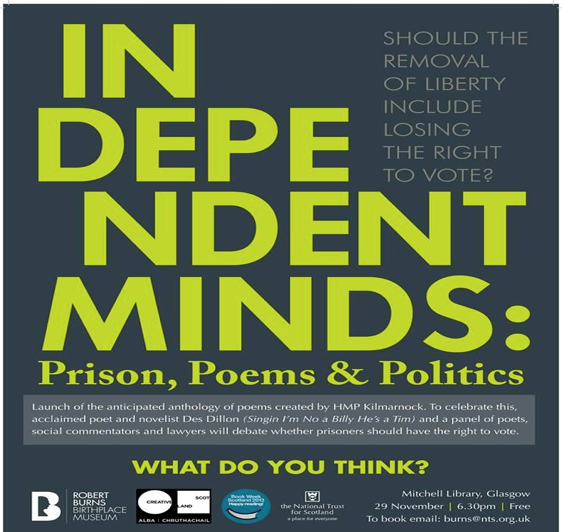 The anthology is launched tomorrow evening at Glasgow’s Mitchell Library (29th Nov) with a discussion on whether prisoners should have the right to vote. It’s the first book I’ve edited since the heady days of Rebel Inc ended thirteen years ago and I’m proud of this one. The workshops unblocked so much creativity, thought-provoking ideas and compassion among the prisoners the anthology is a credit to each and every one of them. Writer Des Dillon is chairing the debate and I’ll be joined on the panel by a number of special guests with an interest in the subject. It starts at 6.30pm and all welcome. (Free). I’ve never quite understood the reasoning that prisoners shouldn’t be allowed to vote. Surely the vote should never be allowed to be taken away from a man/women no matter what. How many criminals are created out of modern society. Tax evasion, refusal to pay fines and the like- these are often political acts in themselves and should not strip someone of their minor power to choose the people that represent them in government. I would say the same of most crimes of passion. Agree Angus. And if prison is really about rehabilitation and re-integration back into society why strip a person of their citizenship? Sadly I have my doubts about rehabilitation and re-integration in general. The current disclosure system to my mind proves this. Does it not only isolate people further to have the stigma of a criminal record which effectively excludes them from applying for even, quite often, menial jobs. Obviously I can understand the reasoning when talking about vulnerable groups. But things like that are irrelevant should not even be available to potential employers.It seems that the current system ensures that crimes that could be considered, in general, largely political acts or folly ensure that the said person is permanently excluded from a meaningful position in society. Hopefully in the future things will change.